• Castile Soap originated from Castile, Spain and has been valued for generations for its purity, natural cleansing and variety of uses. • Dr. Natural Castile soaps incorporates the natural properties of oil blends, natural fragrances and organic Shea butter to work as an ultra-moisturizer that helps to revitalize your skin, resulting in a naturally soft, smooth and balanced skin. • It is healthier for our skin. Its natural ingredients make it a multi-purpose soap that is delicate enough to be used on all skin types. 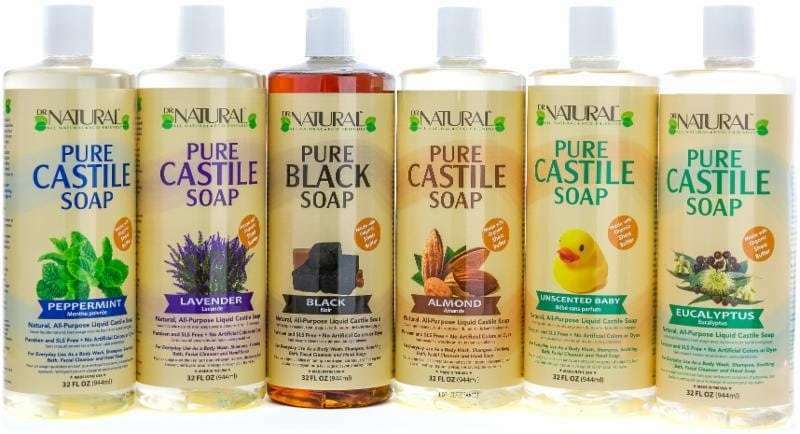 • Dr. Natural Castile soaps comes in 6 calming and aroma therapeutic fragrances – Almond, Peppermint, Lavender, Eucalyptus, Unscented/Baby, and Pure black. Our niche is our quality and competitive price. We have been able to produce an all-natural soap (made in the USA) that has organic Shea butter, at a cost that gives the customer another option to this expensive retail category.